By Sheila - New Zealand - 05 Sep/03 - Viewed 2571 times. New Zealand was cold & wet when we arrived. It was a bit of a shock after several weeks of hot weather, from record temperatures in England to an almost perfect climate in Fiji. We landed late on Thursday but having booked a hotel 5 mins from the airport we should have been in bed by midnight except for a lack of communication between our travel agent and the car rental company who refused to believe we had prepaid. He eventually agreed to let us take the car and we arrived at our hotel around 1:00 in the morning. The Grand Chancellor was very grand and good value at NZ$107.00 + GST for a double room. Internet is only NZ$6.00 an hour. The next morning we drove to the Coromandel Peninsula to the Mercura Puka Park resort. This comprised a group of chalets set on a hillside with only pedestrian access to each chalet. Not a place for the old or infirm and quite expensive at �92 for one night. All the houses in this part of New zealand are built of wood and it gives the place a wild west feel. We had a nice, if chilly walk along the 3km beach and later a beef hot pot in the only restaurant in town. Walking back to the chalet up the steep hill from the car park was not easy and we had to stop to catch our breath a couple of times!! The next morning the sun was shining and it felt a tad warmer. As we drove south to Rotorua to see the hot mud pools and geysers we passed orange and lemon groves and other warm climate vegetation so its obviously not always as cold as when we arrived. The most noticable plant is a very tall fern that grows to around 20 feet. You can smell the sulphur from the mud pools nearly all over town. The Rydges Hotel is very comfortable and only a few minutes drive from one of the geyser sites. Our room had lovely views over the race course next door and a deluxe spa bath! We had prepaid �60 for the room which seemed good value. It cost NZ$19.95 to enter the N Z Maori Arts & Crafts Institute which is where the Pohutu Geyser and mud pools are located. There are quite a lot of bubbling and steaming pools and several geysers, 2 of which erupt almost permanently. The others are intermittent and didn't show while we were there. Later quite by accident we happened upon the site of a recent volcanic eruption. 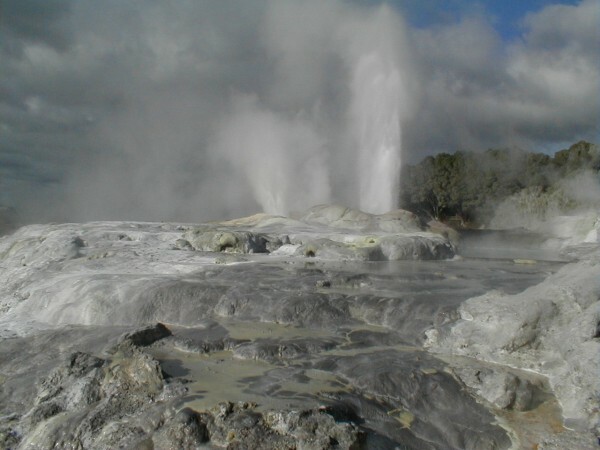 On January 26 2001 there was a small eruption in Kuirau Park right next to the road, where mud, steam and debris were thrown 200m into the air for around 15 minutes. It was a bit spooky to see steam still rising from the site as well as apparently from underneath the road! Rotorua also has a very picturesque lake and we were sorry we couldn't spend more time there (but then again i guess there could be another volcanic eruption at any time!). On the way back to Auckland we made a detour to the Glow worm Caves. This is really worth the trip. The tour goes every half hour and takes about 45 mins ending in a slow boat ride in the dark underneath thousands of glow worms. Our guide was a NZ lady with a sense of humour who made it very interesting. Unfortunately photography in the caves is forbidden. See link below. The next day we drove to the Bay of Islands. Although we were driving towards the equator it seemed to be getting colder. The hotel was very nice and in picturesque grounds but there was no heating in the public rooms. The buffet dinner was very enjoyable though and we spent the evening catching up on our washing in the guest laundry. When John opened the curtains the next morning there were about a dozen strange birds feeding on the grass outside our window. I was hardly awake but i got up and spent the first 10 minutes of the day filming them until they all disappeared. I got frost bite on the way back to Auckland. There was no sun and little wind so that can be the only explanation for my red face and chapped lips. We had wandered around Wangerei for 3/4 hour to stretch our legs and for 1/2 an hour in Wellsford clutching a bag of chips for warmth. The question is how do they manage to grow bananas and oranges here?